Scott take kids' cycling seriously. There are no cartoon characters, fluffy colours, or slacking on the technical backstory for each of their 'youth' models. 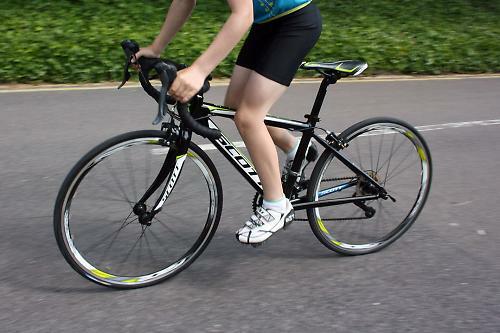 The Scott Speedster Jnr 24 is as serious about the business of going fast as Scott's top end carbon fibre Foil models. Just like adults, kids respond to fast bikes, riding them more, push their limits. Ultimately, falling even deeper in love with cycling. At £649 the Speedster Jnr 24 isn't cheap. Plenty of the dads won't have spent this on their own bikes. As with any of the upscale kids bikes we test, the real value is in their lasting appeal and comparatively high resale value. Looked after, it will serve your kid(s) well and then make back much of the money it cost when it finally makes way for a 650b or 700c model. Think of it as an investment in the future, not a wad of cash lost to a one hit wonder. Scott obsess over their frames and this is a small work of alloy art. Proportional frame tube sizes ensure the bike looks like a scaled adult race machine, not a puppy with dog's paws. It also goes a long way to helping keep weight low, an element even more critical for the limited strength and power of kids than it is for gram counting adults. The designers at Scott removed the unnecessary chainstay brigde. Saving every precious gram. Paint durability on previous Scott frames has proven excellent and the Speedster is coping well with life under a busy kid. The feel for what junior riders need to make the bike go as fast as possible extends to the cockpit. The Speedster Jnr 24 comes with a snubby 50mm stem and narrow, very shallow drop bars. Kids want to be able to use the drops, like they see pro riders do on the telly. Aided by their great flexibility, they're able to do so here. 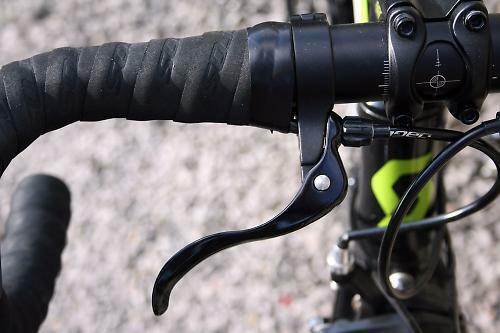 While the bars are suitably narrow to match young shoulders, Scott opt to give some bar space over to a pair of cross top secondary brake levers. For smaller hands the option to brake from the bar top adds safety and security. As a parent they're hard to dislike. Which brings us neatly to braking and shifting. 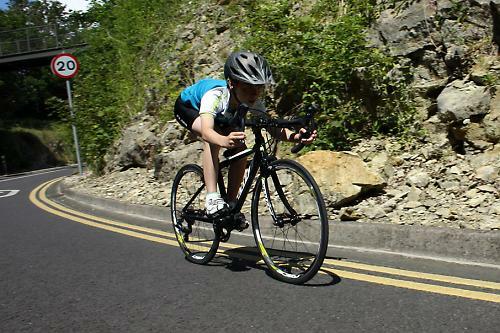 The Speedster is a genuine road bike, fitted with proper road caliper brakes, rather than the common practice of using cantilevers on junior frames. While calipers can limit the ability to run cross ready tyres with mud room, they are are easier to set up and adjust. 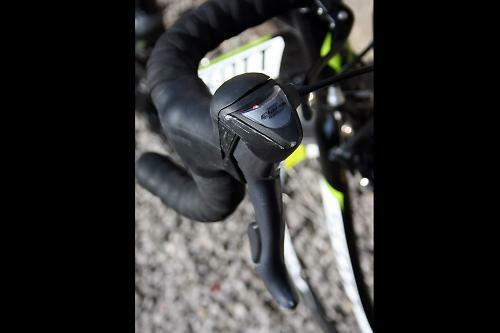 Scott use Shimano ST2300 9 speed brake/shifter levers. Ergonomically great for adults, for kids, they're often still a stretch. On the Speedster Jnr, braking from the hooks is ok, but from the hoods it's sometimes touch and go on whether fingertips have the power and leverage to haul the bike to a halt. So, as we've said, the cross top, as fitted, are a good move by Scott. On shifting, kids love the swing lever/button gear shifting and they have no issues figuring out which bit does what. Which is why we get them to program the PVR. That said their small hands do have trouble with the lever throw distances. Occasionally out testers ran out of finger length before the gear engaged. Not only did this mean gear changes sometimes were not achieved, but worse their attention was diverted from the road to looking at the lever. Shimano would do well to address this issue for kids and adults who find the current throw distances a pain and minor danger. Actual gear shift quality was very good at the rear, as you'd expect from slick Shimano transmission. A faster front shift would be nice to alleviate the long, ponderous affair that it is. It's details that matter. Likewise the gear ratios. Generally good, though we'd have preferred a 32/42 at the front. This would allow tired legs to still get over the hills and spend more time tapping away an even cadence on the big ring and reducing the need for more gear changes. Crank length is 145mm which is a fraction longer than most. The wheels on the Scott Speedster Jnr 24 are lovely. Tight, light and shod with fast rubber. Rims are Syncros, a famous and well regarded mountain bike brand that Scott acquired a couple of years ago to be their in house component wing. The wheels have With 20 spokes front and 24 in the rear, fewer than most others on test. 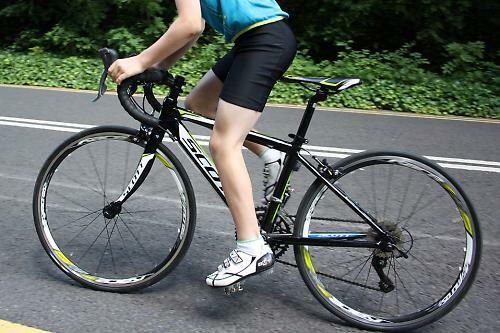 They're the lightest of any kids 24in road bike we've tested. The fact that Kids have limited power, but an enhanced sense of joy from the sensation of speed, is not lost on Scott. Spokes are anodised black, as are the no-name sealed bearing hubs. No issues encountered or expected from either. The slick 1 inch wide Kenda tyres look fast and roll accordingly. Lots of grip, though, in our experience, juniors posess an uncanny ability to run into potholes , drain covers and cracks in the tarmac, could use a wider, more comfortable and rim forgiving 1.25in tread, with little or no loss of speed. 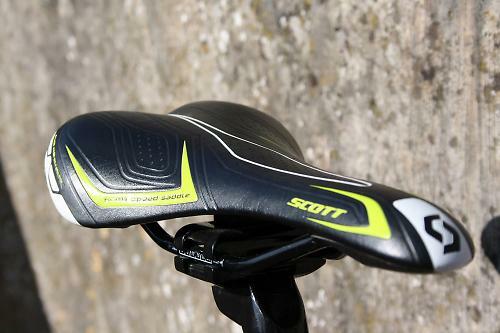 The lightly padded saddle is proportional to the size of the bike and none of the testers mentioned it. With saddles, no news is good news. We like the seatpost QR lever. Kids grow like weeds and being able to add a millimetre on the fly to keep up is handy. Each tester was able to jump on The Speedster Jnr and immediately find a position that was both comfortable and enticing and ride to their physical limits. "I just feel like I can really go on this" was a comment that stuck. I think we've all felt that same surge of enthusiasm when the position clicks on a really racy bike, it translates even to kids. The bike holds a line well, at slow speed steering off the bar with accuracy and stability. As speed increases the balance, light weight and fast tyres allow a flowing leaning style, encouraging instinctive tipping in to sweeping corners. With the stability comes the confidence to get up close behind Dad for a draft, while still responding to last minute, unseen road hazards. 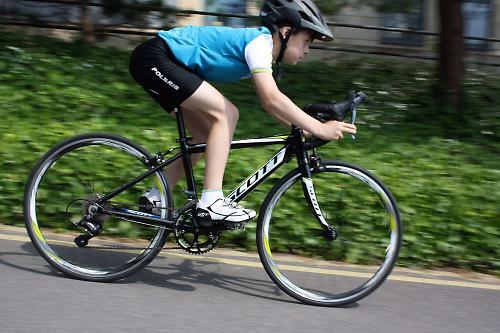 The Scott is not without faults, though to be fair, none are of Scott's design or making, but those shared by other kids' bikes and focus upon brake shift geometry and gear ratios. Style shifts and growth will see off both in time. This is a full bore road racing bike shrunk to suit kids. Scott have pulled as few punches as possible to retain the balance and feel of a genuine race-bred road bike. Really neatly built with lots of detail like bridgeless chainstays to enhance ride and reduce weight. 6061 T6 alloy. Sized and proportional for children. As per their adult road models the JR speedster is pin sharp on the road. Perfect for the intended age group. Yes the bike had a nice smooth road feel. it was stiff enough without battering the rider. It changes direction beautifully, yet holds a line without asking you to make constant adjustments. No, none that come to mind. The light weight of the frame and fast light wheels and tyres helped most. It goes when you ask it to go. Riders felt able to launch sprints with ease. The Speedster felt nailed at speed, our testers said. The bike isn't cheap, the component spec is on par. The chainrings are a bit too large. The riders loved the lower, fast spinning gears of some other bikes tested alongside the Scott. No issues, even though they got pounded. Very good for a kids' bike. Could have used a wider slick for more comfort, grip and rim protection. Great wheels for a kids' bike, even a quite expensive one. Might have used a wider tyre for increased grip, comfort and rim protection. As per all the bikes we tested the reach to the integrated gear levers was on the long side for small hands. All components are good. Would have fitted a lighter seatpost, easier reach gears and smaller gears. Would you recommend the bike to a friend? Have done. A blindingly good proper road racer for a kid. The sort of bike all adult riders wish they'd had when they were kids. Needs a lower bail out gear. Very good, slick and never went out of adjustment. Tip it in, look forward and hold on. I really wish Shimano et al would sort their sh!t out and offer brakes/shifters for juniors. Every bike we've looked at so far for my son have the same problem, frame sizes & bike quality have been good but I have little to no confidence he could operate the brakes, nevermind change gear. The fact that the review acknowledges this makes me think the score is too high. Small shifters for women too. My wife has tiny hands, could use tiny levers. But didn't Shimano make a small shifter a few years ago? R650 or something? Plenty of the dads won't have spent this on their own bikes. The dads will have spent more than this on the mums. Details count with kids bikes.. so this is a bit of a mini rant I'm afraid. Scott use Shimano ST2300 9 speed brake/shifter levers. No, I think those are Claris ST2400 8 speed STIs. So 16 speeds, not 18 speeds. Crank length is 145mm which is a fraction longer than most. 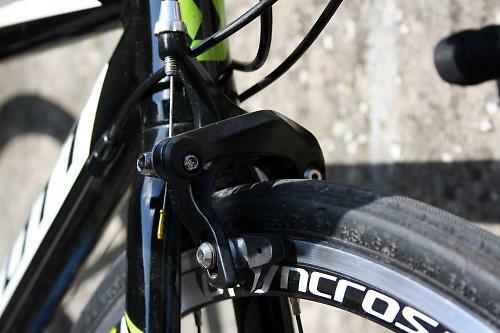 Or it could be exactly the same as virtually every 24" wheel road/cross bike on the market. ...but with noticeably more weight. More of an opinion but light wheels are really important. Kids riding bikes like this don't weight much and you can drop pressures for comfort without much fear of pinch flats whilst keeping the wheels sprightly. Actually other manufacturers are trying not to share these issues by speccing with a bit more care and thought (eg Islabike with reach adjustable Shimano or Moda using Microshift levers). 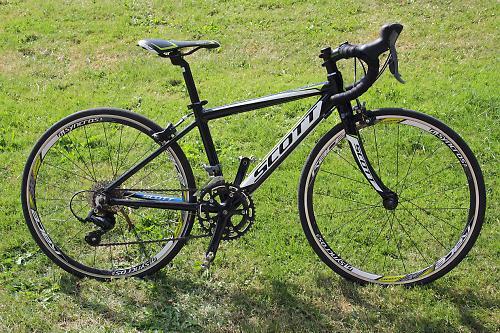 I'd have thought a manufacturer of Scott's size should be leading the way on this rather than lagging behind and simply speccing whatever from the Shimano catalogue best fits the price point. It maybe more of a British thing but other manufacturers are also speccing gear ratios to match age restrictions. So really this review is letting Scott off the hook a bit really. I'm sure lots of people will buy it but a lot will end up swapping chainrings about to meet gear restrictions and bodging reach adjusters so little hands can brake - which is a shame when you've spent 650 quid. And 8/10 for value? Really? Have you looked at the competition? It's over 60% more expensive than the equivalent Islabike and over 30% more than the equivalent Moda, which are both at least comparable in weight. Sorry.. I feel a bit bad dissing any review of kids stuff because it's great to see it taken seriously. But the details really do matter, even more so than with big bikes.